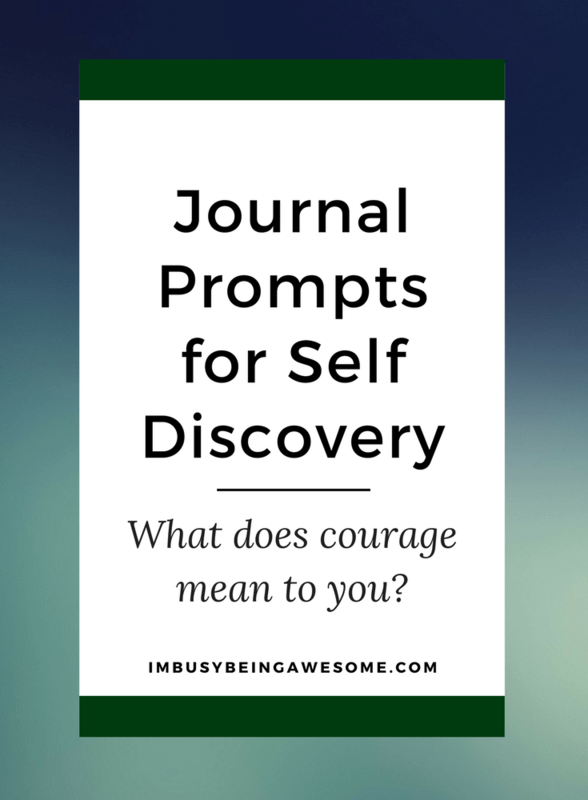 Journal Prompt for Self Discovery: What is Courage to You? What is this new thing, you ask? I’ve decided to start a weekly journal prompt series. What does this mean? Well, for the foreseeable future, I’ll provide a weekly journal prompt that offers the opportunity to look inside ourself, reflect on our thoughts, and deepen our self awareness. Now, I know we’re all incredibly busy, and the likelihood of sitting down to journal once a day just isn’t realistic. Once a week, however, is another story. Whether you physically write down your thoughts, or you simply reflect on the prompt throughout the day – you have an entire week to explore the many layers of one single question. SEVEN DAYS? Yep, that is much more manageable :). So this is the newest addition to I’m Busy Being Awesome. Each Friday I’ll post a question or quotation and provide a few ideas to consider. Then, over the weekend and the following week, we can reflect on the journal prompt, dig a bit deeper, and learn more about ourselves. To me, this simple statement has so much meaning. It is a message of strength and determination, while also providing comfort and understanding. For many years Radmacher’s words reminded me to believe in myself and pursue my goals without restraint. They helped me realize that success and happiness do not simply happen for some people and skip over others. The courageous ones are those who work toward their dreams, even if the odds are stacked against them. The courageous ones don’t give up. Over the past several months, however, the meaning of Radmacher’s quotation has shifted for me slightly. I’m facing some new hurdles in my life, and her words now challenge me to dig deep and ask myself some difficult questions. At the same time, they give me courage to remain true to myself, discover who I really am, and recognize what I need in my life to find joy, balance, and clarity. I find the courage to look inward, to put blinders up to outside expectations, and to listen to myself. Because in the end, I’m the only one who has the answers. How do Radmacher’s words apply to your situation? 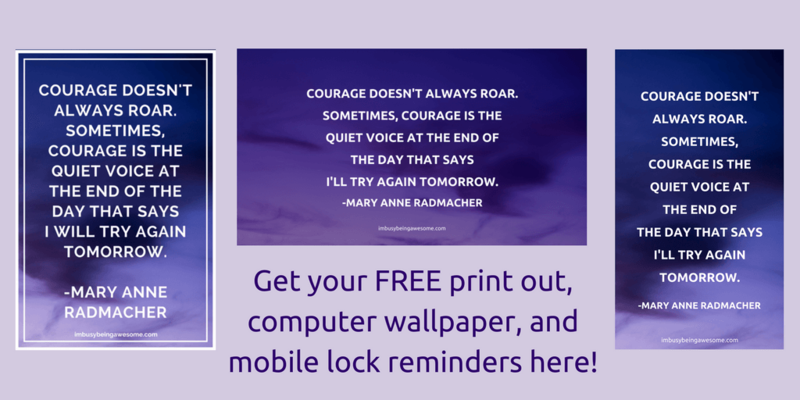 Where do you need courage in your life? To help you remember this message throughout the week, I’ve created a free download of Radmacher’s quotation. Print it out and hang up in your office or by your bathroom mirror, put it next to your bed or in your purse (or all of the above! ), wherever you need need it most. Each time you see the quote, reflect on her message for a moment. AND, thank’s to “SpotonChaos’s” wonderful suggestion below, I’ve also created wallpaper for your computer desktop and your mobile lock screen as well. Now you can have Radmacher’s message everywhere 🙂 Click the picture below and get all three! Tell me, do you regularly journal? 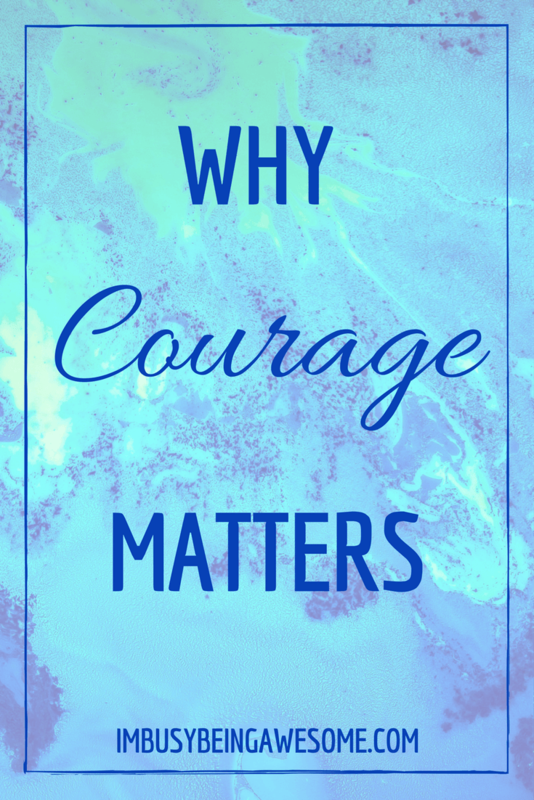 What does courage mean to you? Have you heard this quote before? I’d love to hear from you – let me know below! This is such an inspiring post, I used to do journal everyday but i stopped . For me courage is to not be afraid to tell the truth even if it’s mean breaking friendship or making other people mad. Have a courage to reach your dream even though you are told that you will won’t be able to make it. I love that definition. The courage to remain honest and true to yourself, while pushing for what you believe in is so important. How interesting!! I feel like courage can mean so many things for different people and I even find that it looks different for me depending on the situation but right now, courage is to be able to be honest about what’s going and facing the truth about what I need to do to get to where I want to be. I have been exploring this idea a ton lately. I have been reflecting on the power of gratitude. I love these questions. Thought provoking and deep. This gave me so much to think about that I’m saving it to journal about tonight. Thank you for the inspiration! Oh, I’m so glad. Thank you for letting me know, Samantha! This is so awesome. As an introvert I enjoy moments of self reflection. The focused quote really is a powerful one. Great series. Same here, Annette. It’s so nice to stop and pause a moment. I’m so glad to hear that, Ana. Thank you! LOVE this! 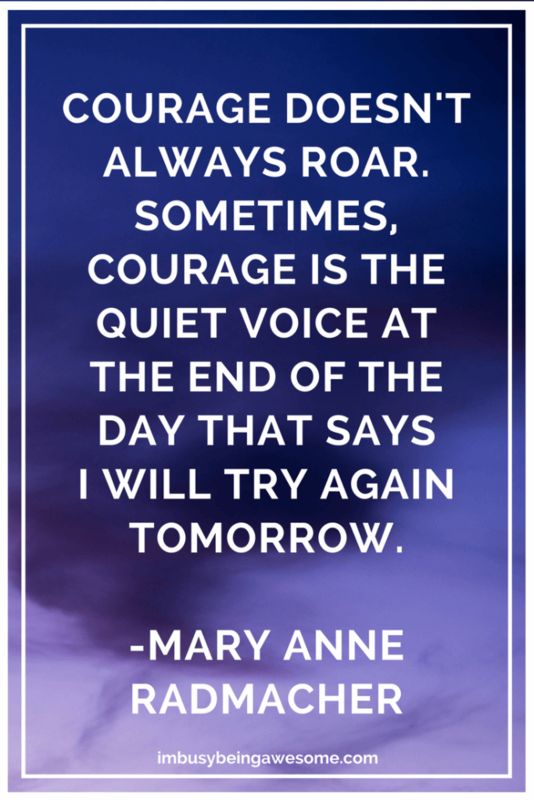 I actually was just asking myself last week during a run what courage meant to me (one of my many mental meanderings I have during my runs, lol), but I’d never gotten around to actually sorting through that thought. I also love that you offer a printable along with the post/prompt for the hanging reminder! Have you thought about doing a digital version that could be used as a screensaver and/or mobile lock screen? Oh my gosh – that’s brilliant!! I hadn’t thought of that, but I know what I’ll be working on tonight 🙂 Thanks so much for the great suggestion! Great idea with the journal prompts. Courage doesn’t have to be loud and obvious. Yes; that’s it exactly. Thanks so much!